Canton, 0 @ North Attleboro, 3 – Final – North Attleboro’s offense exploded for three goals, snapping Canton’s seven game unbeaten streak. Gabe Pinhancos opened the scoring in the 12th minute, finishing off a cross from Zach Matracia to put North up 1-0. Leo Charlebois doubled the lead, converting from the penalty spot after Andrew Fontaine drew the foul inside the area. Pinhancos got his second of the game in the 53rd minute, taking a through ball from Conor Danahey to put the Rocketeers up 3-0. Shawn Watters made six saves in net and North head coach Geoff Burgess said John Brennan was huge defensively for Big Red. Foxboro, 1 @ Sharon, 2 – Final – Sharon scored once in each half to pick up a key division win against Foxboro. Jake Teven opened the scoring in the first half, scoring an unassisted goal from just outside the area to put the Eagles up 1-0. Andrew Reyes-Jones doubled Sharon’s lead, converting a long throw from Tyler Hippler to make it 2-0. An own goal with three minutes to play put Foxboro on the board. Taunton, 0 @ Mansfield, 3 – Final – Cullin Anastasia scored inside the opening 10 minutes off an assist from Sam Hyland to set the tone for the Hornets. John Cooney doubled the lead in the 52nd minute, scoring off an assist from Max Gurnon and James Chotkowski iced the game in the 72nd minute off an assist from Anastasia. Nick Ferraz notched his first career shutout with four saves. Head coach Steve Sheridan had high praise for Sam Nugent, Ethan Brill-Cass, Harry Braidt, Jalaj Singh, Jake Tuleja and Gurnon for their defensive play. Franklin, 1 @ Oliver Ames, 0 – Final – Kevin Hall scored the lone goal of the game in the second half on an assist from Noah Scafati to help the Panthers earn the win. Freddie Beckmann recorded the shutout in net for Franklin. Stoughton, 1 @ Milford, 0 – Final – Stoughton’s Marco Antunes scored his first goal of the season early in the second half as the Black Knights beat Milford. Noah Schulze served in a free kick that Antunes was able to eventually latch on to. Matt Gallagher recorded his second straight shutout of the year. “Milford was excellent and made us play hard for the win tonight,” Stoughton head coach Aaron Salter said. “Marco Antunes was excellent and so was my defense.” Milford head coach Brian Edwards said Andre Oliveira and Marcello Panno put in great performances in midfield for the Scarlet Hawks. King Philip, 3 @ Attleboro, 0 – Final – King Philip freshman Avery Snead scored a pair of goals in the first 20 minutes of the game to lead the Warriors, who qualified for the postseason with the win. Snead converted a pass from classmate Chloe Layne for the game-winner in the eighth minute and doubled the lead in the 19th minute, netting a through ball from Julia Massarone from 10 yards out. Riley Magane iced the game on a shot from just inside the area off an assist from Skylah Caruso. North Attleboro, 1 @ Canton, 1 – Final – Riley Duserick gave Canton a lead in the first half but North Attleboro’s Aine Mendonca leveled the scoring before the break, scoring on a free kick. North Attleboro head coach Bill Wallace said Haley Guertin, Rachel LaBonte and Emily Chiasson played well for the Rocketeers. Sharon, 2 @ Foxboro, 1 – Final – Alex Rabb scored a pair of goals, putting Sharon ahead 1-0 just over 10 minutes into the game and then netting the game-winner on a free kick from 30 yards out just before halftime. Ally Filipkowski notched the assist on Rabb’s opener. Foxboro’s Kristen Bortolotti scored on a penalty kick in the first half for the Warriors. Mansfield, 2 @ Taunton, 0 – Final – Hannah Reiter netted a pair of second half goals to lead Mansfield to the win on the road. Oliver Ames, 0 @ Franklin, 0 – Final – Regan Benton had the shutout for Oliver Ames in Net. OA head coach Britt Sellmayer said Zoe Chazan, Dana Lowney and Kiana Lozzi had strong games for the Tigers. Milford, 6 @ Stoughton, 0 – Final – Gabbie Riley and Maggie Boyle each scored a pair of goals while Julianna France and Sydney Morrison each netted one goal to lead the Scarlet Hawks. Olivia Marshall notched the shutout in net for Milford. Attleboro, 0 @ King Philip, 3 – Final – King Philip defended its home court with a 25-16, 25-13, 25-19 sweep of the visiting Bombardiers. Kat Kmetz led KP with 16 service points while Carly Adams had 14 service points and Sydney Phillips finished with 12 service points and had a strong game at the net. Emma Lopez had six kills and Liv Balduf finished with four kills and 10 service points for the Warriors. Canton, 3 @ North Attleboro, 1 – Final – Canton dropped the second set but rebounded to get the next two for a 25-17, 20-25, 25-19, 25-20 win. “It was a gritty, hard fought battle,” Canton head coach Pat Cawley said. Nicole Poole dished out 21 assists and added six kills and six aces to lead the Bulldogs. Emma Murphy had seven kills six blocks and two aces, Cassie Loftus had her best all around match of the season according to Cawley with five kills and some impressive defensive play. Julia Panico controlled Canton’s defense with 15 digs. Foxboro, 2 @ Sharon, 3 – Final – Sharon won the second and third sets but had to battle all the way to the fifth set to earn the win over Foxboro. Sharon junior Jess Allan led Eagles’ offense with 10 kills along with seven aces. Junior Naomi Topal added nine kills and six aces, senior Faythe Gomolka tallied 17 assists and Cori Jermyn had five aces, six digs and four blocks. Taunton, 0 @ Mansfield, 3 – Final – Mansfield picked up the sweep, 25-19, 25-19, 25-19, at home against Tainton. Chloe Peters had 14 service points and 20 assists, Jess Haradon had 11 digs and eight service points, Meg Hill added 11 kills and Lexi Gardner chipped in with six service points . Franklin, 3 @ Oliver Ames, 2 – Final – Franklin picked up a big division win in five sets on the road at Oliver Ames. Erin Skidmore led the Panthers with 12 kills while adding 23 digs and a pair of aces. Maddie Kuzio also had two aces while leading Franklin with 31 digs. Lauren McGrath had 31 assists to go along with an ace and Maggie Doyle had six kills and five blocks. Attleboro, 0 @ King Philip, 5 – Final – Caitlin Donahue scored a hat trick, netting two goals in the first half as KP held a 4-0 lead by the break. Liz Furfari and Alli Meehan each scored once for the Warriors. Franklin, 5 @ Oliver Ames, 1 – Final – Franklin punched its ticket to the state tournament with an impressive win on the road. Sophomores Annie Walsh and Cassi Ronan each had scored two goals and grabbed an assist to lead the Panthers. Senior Kayla Marshall added a goal and senior Caroline Lounsbury had an assist. Franklin sophomore goalie Christina Lucini made four saves to get the win in net. Franklin head coach Lisa Cropper said Dana Lewandowski and Kate Morse had outstanding games through the midfield and on defense. Stoughton, 5 @ Milford, 3 – Final – Olivia Schlehuber scored a pair of goals for Stoughton, while Kayla Oliviera, Mia Russell and Julia Russell scored once to pace the Black Knights. Sharon, 167 @ Oliver Ames, 146 – Final – Oliver Ames’ Brady Allbritton and Mark Bissonette shared medalist honors, both shooting 36 for the Tigers. Nolan Donze and Thomas Walsh each shot 37 for Oliver Ames. Sharon’s Andrew Glover and Max Avratin each shot 41. Canton, 165 @ Attleboro, 178 – Final – Canton’s Joey Vaughan earned match medalist honors after shooting a low-round of 40 for the Bulldogs. Danny Powers shot a 41 and both Jackson Maffeo and Matt Minichiello carded a round of 42. Attleboro’s Corey McKenna shot a team-low 41 on the day. Milford, 169 @ King Philip, 180 – Final – Ryan Tomaso earned match medalist honors, shooting a round-low 36 for the Scarlet Hawks. Anthony Arcudi shot a 40 for Milford while Danny McLoughlin carded a team-low round of 41 for KP. 1st Quarter: (M) Zach Lanzetta 7 yard pass to Blake Hill, Sean Lehane XP good; (F) Jake Wolowacki 32 yard rush, Nick Yelle XP good. 2nd Quarter: (M) Jack DeSantis 6 yard rush, S. Lehane XP good. 4th Quarter: (F) B. Jarosz 16 yard rush, N. Yelle XP good; (F) N. Yelle 41-yard field goal good. 1st Quarter: Bedford 66 yard pass, XP good. 4th Quarter: (C) Dennis Ross 2 yard rush, Thomas Monagle XP good. 1st Quarter: Connor Finerty 42 yard rush, Diogo DeSousa XP good; Nick Graham 9 yard rush, XP fail. 2nd Quarter: N. Graham 9 yard rush, D. DeSousa XP good. 3rd Quarter: C. Finerty 30 yard rush, D. DeSousa XP good. King Philip, 0 @ Mansfield, 2 – Final – Brendan Sullivan put Mansfield in the lead in the 27th minute off an assist from Chris Elsner. In the second half, James Chotkowski doubled the Hornets’ lead off an assist from Jake Staples. Head coach Steve Sheridan had high praise for goalie Michael Kirejcyzk, saying he played “phenomenal” in goal after nine saves to earn his third shutout. Sheridan also said defenders Max Gurnon, Nick Hyland, Harry Braidt, Ethan Brill-Cass and Elsner played phenomenal. Milford, 0 @ Sharon, 2 – Final – The Eagles struck twice inside a 10 minute span in the first half to pick up their second win of the season. Senior Dan Bender set up both chances for the Eagles. First, Bender found Oliver Huat just over seven minutes in to make it 1-0. Just under 16 minutes in, Bender found Ian Camilli to double the lead. North Attleboro, 1 @ Taunton, 1 – Final – North Attleboro’s Matt Coscarella put the Rocketeers in front in the first half but Taunton scored the tying goal via Daeshawn Duffie less than a minute into the second half. Oliver Ames, 3 @ Stoughton, 1 – Final – Oliver Ames senior Keegan Nutt scored twice inside the first 10 minutes of the second half to lift the Tigers. Sophomore Mason Galbato scored his first career goal shortly before midway through the second half to give OA their 3-1 lead. Stoughton’s Josh Mitchell tied the game 1-1 less than minutes into the second half on a free kick. Attleboro, 0 @ Franklin, 8 – Final – Megan Georges netted a hat trick for the Panthers and Bailey Knouse added two goals. 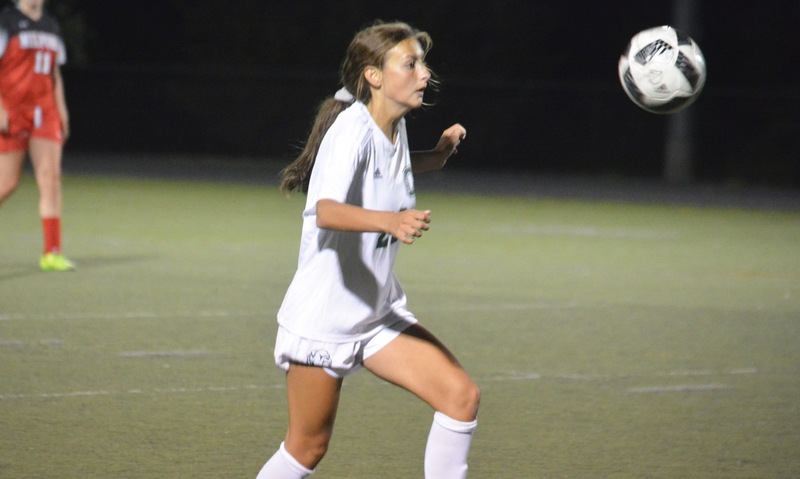 Canton, 2 @ Foxboro, 0 – Final – Riley Duserick and Tessa Cudmore scored unassisted goals for the Bulldogs to give Canton a “solid win,” according to head coach Kate Howarth. Mansfield, 3 @ King Philip, 0 – Final – Emma Goulet opened the scoring for Mansfield 12 minutes into the game on an assist by Jackie Carchedi. Seven minutes into the second half, Jen Kemp scored her fourth of the season, assisted by Katie Bongarzone. With 12 minutes remaining, Trish Murphy scored from 45 yards out for the Hornets. Sharon, 0 @ Milford, 1 – Final – Gabbie Riley scored the lone goal of the game on an assist by Kristen Franzini. Emily Duquette made six saves to record her second straight clean sheet. Taunton, 3 @ North Attleboro, 5 – Final – Haley Guertin had a first half hat trick and added an assist in the second half for the Rocketeers. Felicity Monfils opened the scoring for North and also had an assist on one of Geurtin’s goals. North jumped out to a 3-0 lead but goals from Mariah O’Gara and Sam Tichelaar cut the lead to 3-2. Guertin and Hana Caster scored either side of halftime to build the lead to 5-2 before O’Gara scored a second midway through the second half. Stoughton, 0 @ Oliver Ames, 8 – Final – Francesca Calabraro scored a first half hat trick for the Tigers. Emily Freeman, Jackie Mills, Annabella Walsh, Dana Lowney, and Lauren Wright also scored for OA. Canton, 0 @ King Philip, 3 – Final – King Philip handed Canton its first league loss since October of 2013 with a 28-26, 25-10, 25-22 sweep. Josie Rowean led KP with 19 kills and Gwen Uyrus chipped in with 12 kills to pace the Warriors offense. Micaela Murray had 11 digs and Molly Citarell had five digs while Carly Adams led the team in assists. For Canton, Elizabeth Hamilton and Rye Verille combined for 16 kills and Casey Shea had four blocks. Franklin, 3 vs. Brockton, 0 – Final – Franklin took care of the Boxers 25-21, 25-20, 25-17 in a non-league contest. Aubrie Kutil had 10 kills, Caroline Maguire added six kills and a pair of blocks and Beth Neal had six kills and four aces. Neal also added 16 assists while Dayna McCue had 23 serve receivers, 18 digs and four aces. Head coach Catherine Horsmann said Sam Campbell set the tone in the third set with a run of 16 service points to give the Panthers a big lead. Campbell also had a pair of digs and serve receives. Attleboro, 1 @ Franklin, 2 – Final – Attleboro took a 1-0 lead into halftime but Franklin rallied in the second half. Dana Lewandowski scored both of the Panthers’ goals. Lewandowski tied it on assists from juniors Caroline Lounsbury and Kayla Marshall and then took the lead on an assist from freshman Annie Walsh just eight minutes into the second half. Samantha Jones made four saves to earn the win for Franklin. Mansfield, 3 @ King Philip, 1 – Final – Brenna Puccia, Mary Kate Kelly and Julia Todesco scored in a short time span to lift Mansfield. King Philip’s Alli Meehan scored the Warriors lone goal off an assist from Liz Furfari. Milford, 8 @ Sharon, 0 – Final – After scoring just three goals in their first three games, the Scarlet Hawks came to life offensively. Nicole Fokas and Elena DelloRusso each scored a pair of goals while Jessica Palmer, Christina Capone, Ali Atherton and Danielle Fokas each scored once. Oliver Ames, 3 @ Stoughton, 0 – Final – Nicole Walker opened the scoring for the Tigers off an assist from Hannah Friend. Junior Dimitra Efremidis doubled the lead and then senior Missy Krim added a third off an assist from Nadia Eldemery. Foxboro, 165 @ Oliver Ames, 154 – Final – A trio of Tigers – Steven Tasho, Brian Lambert and Matt Kelley -each shot 38 for the day. Foxboro’s Tim Luciano shot a team-low 38 for the Warriors while Matt Tierney carded a 41. Canton, 163 @ King Philip, 166 – Final – Junior Pat Duggan shot a match-best 38 to lead the Bulldogs to a narrow win over KP. Canton senior Joe Peccia shot a 42 while sophomores Jack Goyetch (one under on the last five holes) and Danny Powers, along with senior Griffin Jerrier, all shot 42. King Philip’s Todd Bushway and Dan McLaughlin each shot a 41 while Sebastian Ladoulis and Mickey Riley each shot 42.